John O'Sullivan and Kris van der Haegen on the Importance of Small Sided Games, Equal Playing Time and the Late Bloomer! » The Importance of Small Sided Soccer Games, Equal Playing Time for All, and Not Forgetting the Late Bloomers! The Importance of Small Sided Soccer Games, Equal Playing Time for All, and Not Forgetting the Late Bloomers! 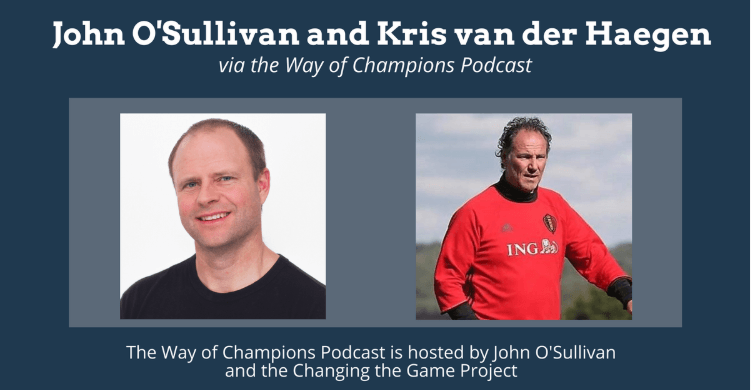 One of my “must-listen to” Podcasts is from my good friend John O’Sullivan – the Way of Champions. Each week John interviews experts in sports, coaching , leadership and building championship programs and this past week did not disappoint! After listening to his spectacular interview with Kris van der Haegen, the Belgian FA Director of Coaching, I immediately reached out to John to ask if I could share some of the interview here on SoccerParenting.com. Below is a 13 minute soundbite where John and Kris are discussing the move Belgium recently made to small-sided play for their U-14 and below players, the importance of all players receiving equal playing time and the unique way Belgium has brought attention to the value of the late blooming athlete. I am so excited to bring this to you and encourage you all to check out the Way of Champions Podcast and all the good work John is doing with the Changing the Game Project! The audio clip is below, and the transcript can be found under the graphic. I want to talk about a couple other things that you are doing with the young players there (In Belgium) as well, which I think is great, and that’s that you’re playing small-sided until U14, correct? You’re playing 8 vs. 8. Yup, the Under 14 is the first age group where they play 11 vs. 11. Right, so you’re sticking small. I think Spain is similar as well. It was a massive battle here in the United States just to get it to 12, and so many people, you know these 10 year olds, they need to play in a full field, but it’s so, it’s ridiculous. You go out and watch, you go watch many 14 year olds, and they shouldn’t be playing on a full field. Right? At least, developmentally. If your right back and your left wing have nothing to do with each other, because no one can hit a ball that far, then they should be playing on a smaller field, correct? Yeah, of course. They are not involved in the game. And the ball is on the right side, the left side isn’t involved anymore. And when you capture the game with a drone, they play 11 vs. 11 on a big pitch, and you make the drone capture the whole game, you will see that they never play on the whole field, the 11 players are never involved. So they will also play on a zone that’s much smaller, and where about 6, 7 players are involved, players around the ball. 6,7, 8 players, and all the other ones, they aren’t. And if you then make … if you check how many times they touch the ball, then you will understand why a lot of players, they won’t develop, because you can’t develop if you don’t touch the ball. Because if that was the case, you should be able to develop by playing PlayStation! Because there, you never touch the ball, but you’re in the game. Yeah, that’s great. You know, another thing with that is you guys aren’t really keeping standings until that age either, right? It’s about hey! – the kids keep score and they know what the score of the game is, but we don’t need to publish standings all over the place. We don’t have standings tables, we call it tables. We don’t have tables anymore, so just starting from under 14, before, no tables, because that was all of the big battles. Players that play to score goals, that play to win the game, and that’s fantastic, because it’s competition, that’s really very nice. But coaches shouldn’t be aware about the tables and trying to win trophies. No, coaches should think about the development of their players, and not about winning trophies at 12, 13, 9, 10, 11, 12, 13 years old. It’s all about the player. It’s not about winning a trophy. And that’s why that we decide to stop making tables or standings, because we saw that coaches, they couldn’t get out of that focus. They were always keeping the focus on “I want my team to win that game”. Is that wrong? Sometimes it is. Because what happens, they don’t make play the smaller ones. Because they think, the big strong ones, we have more chance to win the game. So what happened, the youngster, the smaller ones, the late maturing players, they were at the bench, for 75% of the time. And when the game was decided, then they could come on the pitch. To change that mindset, we have made two big changes. First of all, no tables anymore. And second thing, we play now in four quarters, so like in basketball, and at the end of the first quarter, all the substitutes, all the players that were on the bench, they have to come on the pitch. And the same thing after the third quarter. So all the players on the bench, the come on the pitch. And the coach cannot take any substitutions during the game. Only at the quarters, and that’s what we call, okay we make a break, we have there two minutes, it’s perfect to do some individual coaching with players, you make the substitutions, and there we go for the second quarter. Love it. Yeah, and they have to play a minimum of 50%. So they have to play at least two of the quarters. By doing it that way, they play at least 50%. But these are the regulations, in our club, we even go further, we say okay, after the first quarter you do it, but also at half time. You change it. So that means that every player plays at least 75% of the time. And that’s fantastic for the player, because that’s the only way to make, to let them make progress, and to let them to make them develop. Because they don’t develop when they are at the bench looking at the game. Right, exactly. And I mean, again I think again all these things make sense from a kid’s perspective. They want to play, or they’ll walk away. They’re never gonna love the game. They want to play in practice. No kid shows up at practice saying I want to stand in line today. I hope that’s what coach does. All these things… They get more touches on a ball in small sided games. All these things are about what makes this best for kids. It always comes back to that, right? Of course, of course. And some adults that don’t understand, even some parents, they don’t understand that’s other players who are considered to be not the best of the team, that they get as much playing as opportunity as their own kids. Some parents don’t understand, and then, yeah, we have to work with the parents too, to explain to them if this is your son or your daughter, will that change your mind? And I had in my club some coaches who were very difficult to understand it, but then at the certain moment, it was about their own kid, their own son, being on the bench. And then they were the first to say, yeah, yeah, yeah, of course, everybody should have the same playing opportunity. Because that’s why they come to your training session, and that’s why I said a starting point. If you make them love the game, afterwards you can start teaching them. You can start teaching. But if they don’t love the game, development, learning will stop. They will get out of it, step by step. And then one other thing, that you guys are doing there (in Belgium), which I think is fascinating. In the world of sport, we’re now talking a lot more about developmentally, not the age the kid is on the calendar, but the age they are physically maturity-wise. And so in Belgium, if they have a doctor’s note, because they are a late maturer, because they are a late bloomer, you actually even allow them to play down, to their developmental age, correct? Yeah, absolutely. They are not obliged, because some of them, if they don’t want to do it, if they can’t deal with the situation, it’s for us, it’s perfect, because again there, it’s all about the player. We adapt to the player. If some of them, they are really so thin and so little, that yeah, it’s very hard to compete with some others who are advanced. Because then sometimes you have even two three years difference, it’s not an equal battle. And that’s why we have, they have the authorization to play down, to play one year lower. And it’s not just they who can decide, it must be confirmed by a doctor, a sports doctor, who knows the references, who knows really these are the standards. And then they have the authorization to play one year lower. This is perfect because then you put them in an equal battle, and there they can show their skills. Right, exactly. Because at 16, 17, 18, it all starts to even out anyway. And you want that very technical player who is very small and slight, that wasn’t beaten to a pulp trying to play. I mean, we talk about 12 year old boys who could look like a 15 year old, or a 10 year old. They can have a five year developmental age swing, and you’d never play your 10’s against your 15’s and say this is a healthy environment for those 10 year olds. But we do that all the time with 12 year olds, and I think this (playing down) is brilliant. The big mistake that people, that coaches and clubs make, they consider these boys, or girls, who are in advance, who are early mature or early performers, they consider them to be the biggest talents. But that’s not about the real football talent, it’s about early performer physically. And then you see they put all their eggs in that basket, of these players, and then they see they grow up, and then they got out of the team. Because we thought oh, they will go to the senior’s team. But then you see the small ones, who have developed, developed, developed, and these were really the big talents. But if you don’t, if you are not aware of it, yeah, you lose them. You know National 18, for example, there are several players, (Yannick) Carrasco, (Maarten) Martens, Charly (Musonda), they were all late mature players. Kevin De Bruyne, they never appeared in the National teams. Never appeared in the youth (National) teams, just at a very late age, when they were adult. Kevin appeared for the first time in Under 19, because he was a late developer. And now he’s considered to be the best player in the Premier League! Yeah, I know they talked a lot about that in 2014, with the German team, how many of those players never appeared on a youth national team either. And I was reading something about in England, 15, 18 years ago, they had a U 17 team that made the Under 17 World Cup Semi-Final, and the only player to get more than one National Team Cap off that group was Wayne Rooney, at the senior level. Of 50 kids in the pool, only one got more than one Senior cap. So it’s a very poor indicator of who’s going to be very good later on, and that’s at 17, never-mind nine or ten. These are not the physically big players, but they have really developed their brain, the position, the intelligence, yeah, and that’s what modern football is. It’s about reading the game, making quick decisions, and being able to do it, to execute what you have in your mind. Thank you for this! This kind of information cannot be circulated enough in a frequently winning-driven culture. It’s such a challenge to help keep the smaller, younger players motivated, and hard for their parents to see them go through the disappointments.